The holiday home was built in 1996 and furnished with gusto. It has got a large open gallery in the living area, a terrace, a big garden, with woodland behind, and is situated directly on a district road at the upper village edge in a central but quiet location It is built on a plateau with sunlight from morning to evening (south-west location) with parking spaces just outside the house door. You walk just some 400 m to the village center (post and shopping facilities). There is a lift connection to a vast skiing area right outside the entrance door, at a 200 m distance from a cross-country ski run (52 km long), and a slide right outside your doorstep. A well-known large skiing area with the most up-to-date skilift facilities in a valley opening to the south, and marvellous skiing and hiking areas. With skiing facilities and paths to the south-east und south-west. With a lot of action and happenings, such as cup races, and snow parades (equivalent to the love parade). Sports unlimited in winter and summer: Valbella-Lenzerheide, better known as 'sports unlimited'. The ideal place for older and younger people, the active and those looking for a rest, as well as for hobby and top sportsmen. The holiday programme is extremely varied and sports facilities are inexhaustible. In winter : a top class skiing area with 2 sunny valleys. In summer: a paradise for families and the active. 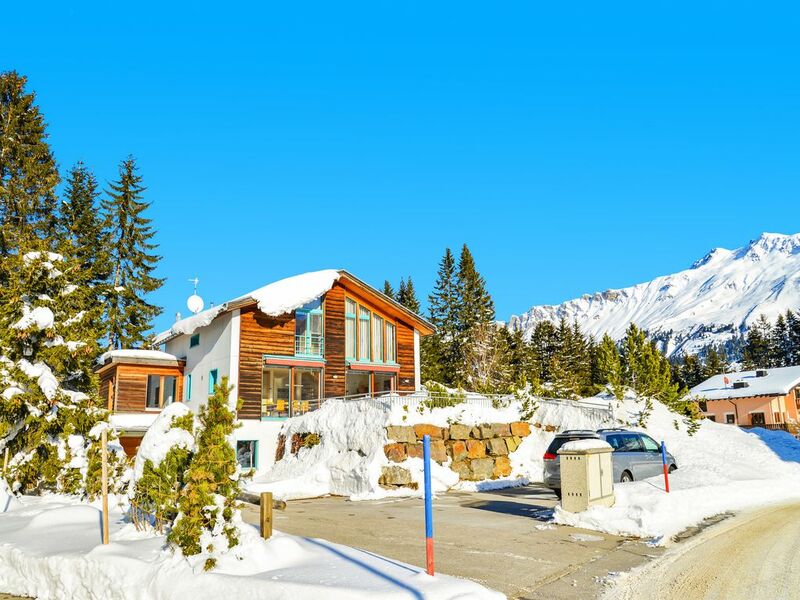 The most up-to-date transport facilities will bring you to breathtaking viewing points and extra class ski runs. Families enjoy special discounts on the funicular railways in winter and summer. Lenzi's Kids' Club - the holiday kindergarten! Valbella in summer : Dolce far sports: Holiday programme with 20 sports varieties guided by instructors : aerobics, badminton, squash, tennis, golf, basis fitness, bike courses, bike tours, inland skating, jogging, vita courses, power training, morning exercises, archery, darts, swimming in the lake, volleyball, stretching, relaxation, walking, nordic walking, water games for children. Family fun on the idyllic Heidlakes' shores with surfing, sailing, pedalo, rowing boats, hydrobike, climbing mountain, pirate ship, kids' paradise (pirates' island, raft ferry, playing brook, suspension bridge), volleyball field, table tennis, fishing an grilling. Other summer activities: 140 km of marked paths are waiting for you including game observations and fungus trips. You can rise to the skies with hanggliders, delta fliers and balloons, you can go riding, playing tennis (14 tennis courts), and at the sports centre Dieschen you can enjoy acquafit, swimming, minigolf, power training, steam bath, sauna, whirlpool, solariums, slides or ice hockey and ice-skating at the Ice Hall. Mountain bike drivers can look forward to a 110 km long network. Inland skaters and skateboarders are welcome. You can also explore adventurous sports such rafting, canyoning, hydrospeed or visit the longest toboggan run in the world. please contact us and tell us what kind of pet you have got. A well-educated pet shouldn't be a problem. If you may smoke on the terrace or outside the house welcome. This beautiful house was a non-smoker-house up to now and might be a pleasure for other non-smokers. Valbella - which means ' beautiful valley' - is 1500 to 3000 meters above sea level - 1,5 km before Lenzerheide - assured of snow from Dezember until end of April (all lift facilities open!). A fantastic skiing, snowboard and crosscountry skiing area. A free sports bus taking you everywhere in winter. Splendid hiking area : situated directly by the idyllic Heidlake (bathing, water sports, childrens' fun world, game and sports fields, table tennis). Golf: One of the finest alpine golf courses is expecting you: far away from any road, kept apart from any type of noise, here you can relax from your hectic everyday life. The 18-hole course (par 69, lenght 5,274) is situated 1400 meters above sea level in a parklike setting. Many public tournaments take place here. Two-storey open and covered driving ranges and puttings are available for everyone. Then a clubhouse with bar and good restaurant. The golf course is 1,5 km outside Lenzerheide. There is also an indoor golf facility with swing analyser publicly available in one of the hotels. Ski: 150 km of prepared pistes at altitudes assured of snow (1'500 to 3'000 meters above sea level) for skiing, carving, skwal, telemarking, freestyle/pipe-skiing and snowboard (in addition, a shaped halfpipe, rough pipe and nature fun pipe). The Rothorn is a predistined freeride mountain. With 52 k of prepared cross-country ski runs for classics and skating. Various slides (lit at night as well), ice-skating on 5 natural ice rinks or thoughout the year at the Dieschen Sports Centre, and snowshow walking or snow volleyball or simply 'winter walking' on 80 km of marked and prepared footpaths. Im Mietpreis inbegriffen sind 2 Autoabstellpl. sowie ein zeitlich unlimitierter Internetzugang /Terminal vorhanden. Nicht inbegriffen: Endreinigung SFr. 200,-, Bettwäsche obligatorisch SFr. 25,- pro Person und Woche, Frotteetücher/Küchentücher auf Wunsch SFr. 15,- pro Person und Woche, Kurtaxe: Erw. (ab 16 Jahre) SFr. 3,30/pro Tag, Kinder (6-16 Jahre) SFr. 1,65/pro Tag, Kinder (0-6 Jahre) gratis, Kaution: Sfr. 300.--. Die Kaution wird 7 Tage nach Mietende per Bank rückerstattet, sofern keine Mängel entstanden sind. Anreise jeweils Samstags ab 16h00 oder später. Abreise jeweils am Samstag spätestens um 10h00.